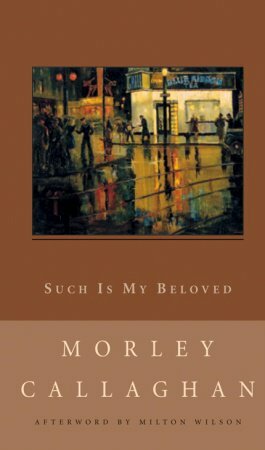 “One of the great novels of the 1930s, Such is My Beloved recounts the tragic story of two down-and-out prostitutes and the young priest who aspires to redeem their lives. The novel is at once a compassionate portrait of innocence and idealism and an emphatic condemnation of a society where the lines between good and evil are essentially blurred. As mentioned in my forum posts, I found Callaghan’s style to be similar to that of Hemingway, whose stories I’m currently listening to on CD. I’m reading Bleak House too, and the contemplation of charity is to the fore in that book as well. I’m sure this book would have been more controversial and certainly timely during the Depression when it was written. Isn’t Father Dowling doing what he’s supposed to be? And this is a scandal because he’s relating with prostitutes. Of course there is irony in the fact that Jesus was criticised in exactly the same way for doing the same thing. It’s interesting to see how little has changed with regard to how women go from being respectable to being prostitutes. It’s not like girls set out to have prostitution as a career, right? Only now, instead of having the option to get out of it if a job or assistance presents itself, many are further trapped by drug addiction. As for Father Dowling, how much of a fool is he? Was he kind of crazy to begin with? Certainly obsessive. The novel itself was straight-forward (short too) without anything extraneous–including exposition by the author. Just the facts, ma’am. I generally like a book with more curly-cues (Dickens, anyone?). I can see why Morley Callaghan is considered such a good writer, and I’m looking forward to more. “It is 1917, and the nightmare of World War One is dragging on through yet another winter. As far as Penelope Wain knows, her lover, Neil Macrae, has been killed while serving overseas under her father. That he died apparently in disgrace does not alter her love for him, even though her father is insistent on his guilt. What neither Penelope or her father knows is that Neil is not dead, but has returned to Halifax to clear his name. I’ve started a bookring for this book. If you’re interested in joining, PM me. Initial comments—I wish I had been to Halifax. I’d love to be able to picture the harbour and the city. I’m really enjoying the development of the characters. This was quite a good book. The description of the effects of the Halifax Explosion was phenomenal. It put one right there. Of course, I couldn’t help but compare it to more recent disasters (9/11, Asian tsunami, Hurricane Katrina). MacLennan really captured that sense of everything being normal one moment, without a hint of anticipation, and the next moment the destruction of normalcy. It also did a good job of taking a portrait of the country in minature at the time when we were pivoting towards the future. I ended up reading from the beginning of Thursday right to the end of the book–what compelling reading. You are currently browsing the Reader of the Stack weblog archives for November, 2005. If you'd like to comment on my blog, you'll have to register (an anti-spam measure).